The golf tee box in the left photo is like plowed ground, from mole damage. The same tee box in the right photo is smooth and pest free. we guarantee Yard Gard will work for your lawn. Money back guaranteed if you are not satisfied with the results! Try it, we promise you will be satisfied with the results or your money back, guaranteed. How Does the Yard Gard Mole Deterrent work? Moles normally live 2 to 4 feet beneth the soil surface; they spend the majority of their life underground. 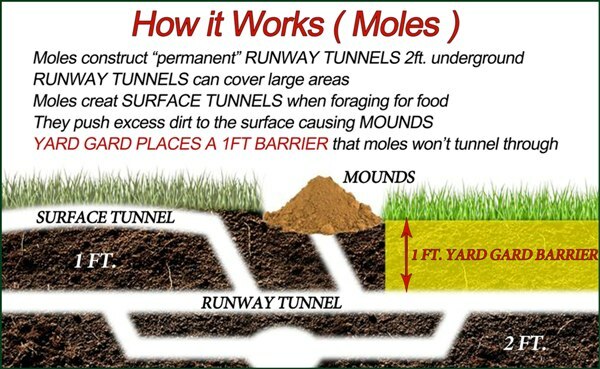 they clear out excess dirt from their "RUNWAY TUNNEL" by push it to the surface, creating the mole "MOUNDS"
they forage for food just under the soil surface creating the "SURFACE TUNNEL", which leaves a trail of raised soil and dead grass. Yard Gard Mole repellent is made with two main components: The Pellet & the Active Ingredients making it easy and simple for you to apply to your lawn. Yard Gard's ingredients are placed inside the pellet during manufacturing, where the pellet is also encased with a water-soluble coating agent encapsulating the ingredients inside the shell, which assures you of fresh repelling ingredients when you apply Yard Gard to your lawn. Watering your lawn dissolves the water-soluble coating shell which then releases the powerful ingredients of natural oils, spices and minerals to be slowly absorbed into your lawn, yielding your most effective, long lasting repelling results for your lawn. The ingredients are absorbed into your lawn over several months, therefore protecting your yard from pests for the longest time period. These ingredients create a repelling barrier extending from the lawn's surface downward for one to two feet deep, forming the "No Mole Zone" that moles will not travel through, thereby your lawn or garden is protected from these pests; the animal will not come up to the surface of your lawn. How is Our Process Advantageous to You? Organic ingredients decay quickly when exposed to the elements. Yard Gard products uses a wide variety and high concentration of ingredients. Yard Gard's active ingredients are loaded inside the pellet, sheilding them from exposure to the elements until they are released into the soil. Some support ingredientrs are attached to the outside of the pellet; the pellet is then coated with a water soluble caoting agent, sealing the ingredients inside. Yard Gard products are composed of natural/organic food grade oils, spices, and minerals. Yard Gard products are safe: No harsh man-made chemicals & will not harm humans, pets or the environment. Does Yard Gard Mole Deterrent work? MOLE ACTIVITY: (Vertical scale) Is indicated by the numbers on the left side scale. 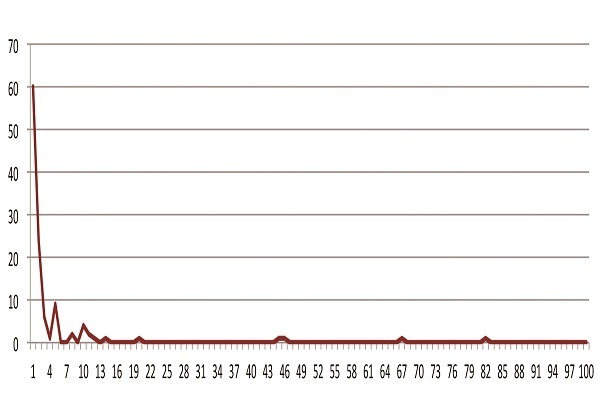 The higher the red line extends up on the graph's scale equals the amount of mole activities for that day. RE: The higher up the left side scale equals more activity; if the line is at "0" it means no activity. RE: Studies extend From "Day 1" to "Day 100". The effectiveness rating, ranges from 95% to 100%, and depends on three keys conditions. First the amount of water applied to the treated area. Second the number of animals (moles) tunneling in the treated area. Third, the thickness of dead grass (thatch) in the treated area. This principle is 'operant conditioning'; made famous by the scientist Pavlov when he conditioned dogs to salivate when the food bell rang.